‘History is a weapon’ (ix) Neil Faulkner boldly declares at the outset of his one-volume global history. This pugnacious opening sets the tone for the style and substance of the rest of the book, which confidently combines high levels of scholarship and argumentation with a radical commitment to taking historical analysis out of the academy where it is written and onto the streets where it is made. Faulkner impressively distils several generations of Marxist historiography into a fast-paced narrative, providing an informative and inspiring overview of human development over the last two million years or so. The left might have been in political retreat over recent decades, but the output of Marxist historians in that period has facilitated the construction of a diverse but discernible intellectual tradition that is the envy of conservatives, particularly in the Anglophone world. Names such as Childe, Hobsbawm, Hill, Thompson and many others are in the front rank of the academic pantheon, perceived as authorities even by their political opponents. Faulkner assimilates the revolutionary work of these and other Marxist historians ,along with the pioneering analyses of historical materialism devised by Marx and Engels, into a broadly coherent framework that makes the vicissitudes of global history intelligible and provides a powerful theoretical platform for action. In contrast, Faulkner explicitly states that his approach is based on a view of ‘history as open, contingent, and shaped by human agency’ (334). The apparent dichotomy of structure and agency he refers to is one that has plagued Marxist historiography over the course of the last century and provoked weary accusations from the right that historians in this tradition are wedded to the notion of economic determinism. The intellectual left, however, has not always done itself any favours regarding this conceptual tension; oscillating at times between the voluntarism associated with Sartre and others and the subject-less paradigm constructed most intricately by Althusser. Faulkner provides a cogent rebuttal of this misconception and, in doing so, devises a methodology that potentially transcends this perennial debate. He adopts a tripartite model of historical analysis which enables a differentiated unity to be achieved between the poles of humanism and structuralism, and allocates varying degrees of impact to technology, intra-class conflict and inter-class struggle according to the dynamics of a particular conjuncture. Human development since the Neolithic era 5000 years ago has ‘been driven by three motors of history-technological progress, ruling class competition, and the struggle between classes – and it has been uneven and uncertain because the workings of these mechanisms especially in combination, can be fraught’ (296). This is an innovative and open-ended model which avoids stale determinism based excessively on technology, and unsustainable voluntarism based on the exaggerated ability of the oppressed to topple regimes by willpower alone. The impact of the first of these motors was visible in the transition from the Bronze to the Iron Age around the turn of the first millennium BC: ‘The bronze smiths worked for the palaces, the blacksmiths for the villages. Iron gave the common man a spear, even a sword. If he stood shoulder to shoulder with other men … he could stop a chariot charge. And if he could do that, he could kill the landlord. The ironworkers of 1000 BC, had they but known it, were smelting revolution.’ (27) Faulkner perceives the rise of Europe’s first imperial leviathan to predominance in the Mediterranean world a few centuries later as being an exemplar of the second motor: ‘The rise of the Roman Empire, on the other hand, though based on iron technology, was powered by military struggle between rival ruling classes and rival factions within the Roman elite. Here, struggle at the top for control of surplus was the prime mover’ (76). The contest between classes for hegemony which denotes the third motor is what characterises many of the seminal events of modern history. Faulkner provides vivid descriptions of the key revolutions which have punctuated global history over the past few centuries, and is especially keen to emphasise how they were often driven by popular protest from below. In the Dutch Revolt of the 1590s, ‘Members of Calvinist and Anabaptist congregations functioned like the activists of a revolutionary party’ (100). The English Revolution a few decades later was ‘buoyed, cajoled, and pressurised by extra-parliamentary mass mobilisations of London’s middling sort, the urban poor, and working poor’ (107). The Paris Commune of 1871 took this liberatory dynamic among the oppressed to a new level by forging a model not just for protest but also for seizing power: ‘Not a repressive state raised above society, controlled by the ruling class … but a state embedded within society itself, where elected bodies and armed militia were expressions of mass participatory rank-and-file democracy’ (164). Faulkner’s emphasis on contingency means he does not lose sight of the sober reality that many such upsurges from below have often been characterised not only by euphoric solidarity but also by crushing defeat. Revolutionaries in Germany and Italy after the First World War were presented with opportunities to conquer power but were undone by erroneous strategy: ‘Timing is everything in the art of revolution. The summer of 1920 was almost certainly a moment when revolutionaries could have led the working class to victory in the heart of Europe. The price for their failure is incalculable’ (208). Faulkner is keen to stress the implication of this model is that historical development is often far from the ineluctable upward trajectory conceived of by Enlightenment thinkers such as Condorcet. Things often do get worse. Faulkner’s dynamic model of three interacting motors driving history at an uneven pace and not always in a linear fashion is to be welcomed as it adeptly avoids the twin poles of structuralism and humanism and permits the promotion of a nuanced Marxist historiography. Another element of his methodology that is innovative is the notion that historical development can be conceived of as a sequence of cycles and arrows. The former represents the impact of nature on social organisations; the biological imperatives of birth, growth and death in the lives of countless individuals that incrementally accumulate over centuries into a collective storehouse of knowledge and understanding of the world. The arrows refers to those moments in the historical record when the tectonic cycles are suddenly accelerated and compressed into spasms of rapid political movement and intellectual breakthroughs. As he puts it: ‘When history’s cycle is dominant, change is quantitative and limited. When the arrow is dominant it is qualitative and transforming.’ (75) This is a neatly dialectical approach to the manner in which many of the great revolutions of modern history can be perceived to have gestated in the womb of an anterior regime until the pressure from below became intolerable and they exploded with an emancipatory force that could not be resisted. Faulkner’s metaphoric deployment of the three motors and the cycles and arrows underpins his analysis and provides an insightful adaptation of the classical Marxist conception of the base and superstructure model. Other aspects of his narrative, however, stray into heterodoxy and are rather less persuasive. He explicitly rejects the traditional concept of the slave mode of production. Faulkner claims it is ‘hopelessly flawed, both empirically and theoretically and has no analytical value; it is part of the interpretative apparatus criticised above as economically determinist and teleological’ (334). Faulkner instead argues the historical span from 500 BCE to 1500 AD is best comprehended as the dominance of a single mode of production, transcending the classical Marxist classification of slavery and feudalism. He contends the varying relations of production at the two ends of that expanse of time are of negligible significance: ‘It makes little difference whether they are slaves, serfs, tenants, or freeholders, and little again whether appropriation takes the form of tribute, rent, tithe, interest, wage labour, or forced labour'( 334). Faulkner is not the first Marxist theorist to seek to excise slavery from the traditional schema of modes of production. Ellen Meiksins Wood in her 1988 study, Peasant-Citizen and Slave, similarly argued that peasant production, rather than slave labour, was the pre-eminent method of surplus extraction in the ancient world. She further implied that utilisation of the concept of the slave mode was an anachronistic transposition of the ruling class stereotype of the parasitical and idle mob. Geoffrey Ste. Croix in his epic Class Struggle in the Ancient Greek World (1981) provided the most cogent re-assertion of the validity of the slave mode. He recognised the existence of non-slave labour in Athenian agriculture but underlined the decisive factor for categorising social formations was not the quantity of a method of surplus extraction but its strategic location in terms of sustaining the ruling class. Ste. Croix argued that the luxuriant lifestyles of the urban elites of Greece and Rome were conditional on the existence of large numbers of indentured domestic servants in close proximity and without them, these peaks of classical civilisation would not have been possible. Another problem with deleting the slave mode of production is devising a credible explanation for the establishment of early democratic structures, most notably in Periclean Athens and, in a diluted form, in the Roman Republic. Ste. Croix related these advances in political practice to the ability of the free peasantry in both contexts to resist excessive exploitation by their respective elites, and to carve out democratic gains as a means to consolidate improved status. This, in turn, forced the ruling class to resort to intensive slave labour to sustain their wealth and hierarchical position. Faulkner pays tribute to the achievements of Greek democracy: ‘This created a huge mass base for education and culture. The result was an explosion of creativity … There were great architectural monuments like the Parthenon, and superb naturalistic representations of the human form’ (38). However, it is difficult to understand why similar democratic breakthroughs did not take place in the medieval world if it was part of the same mode of production as ancient Athens and Rome. Faulkner’s idiosyncratic notion that the span from Cleisthenes to Columbus incorporates a single mode of production reduces to relative insignificance the vast changes in terms of science, technology and ideology that occurred throughout those centuries. He acknowledges his debt to the Marxist medievalist, Chris Wickham, for this conception of a unified mode of production, incorporating the traditional categories of slavery and feudalism (335). Wickham has classified this epoch as being characterised by the predominance of the tributary mode of production. Not the least unpersuasive element of this conception is the huge range of social relations it has to encompass; from the centralising state structure of imperial Rome to the disparate monarchies of post-Roman Europe. Confusingly, Faulkner also argues the former should be conceptualised as ‘ancient military imperialism or, more crudely, robbery with force’ (335). This view looks disconcertingly like the ahistorical notion of militarism as a factor decoupled from socio-economic contexts, more commonly associated with theorists such as Weber or, more recently, Michael Mann. Once again, Faulkner is at odds with Ste. Croix who argued Rome’s spectacular military outreach can only be comprehended by linking it to the elite’s pursuit of new sources of slave labour. The author’s narrative is on firmer – and conventionally Marxist – ground once it enters the modern era. The centuries since the French Revolution take up over half the book’s length and provide a robust defence of the materialist conception of history. Faulkner delivers powerful accounts of the horrors capitalism has inflicted on humanity, particularly in the last century. His defence of a Marxist version of the origins of the World War One is especially apposite as television screens and newspapers are increasingly filling up with apologias for the carnage by bourgeois historians. As he bluntly states it: ‘In 1914, capitalism tipped humanity into an abyss of barbarism’ (185). This makes a refreshing riposte to the crass attempts by today’s elite to turn the conflict’s commemoration into a celebration of militarism and nationalism. The author’s unsparing attack on the misuses of history by the current ruling class in this context emphatically validates his initial focus on history as a weapon. Similarly, his final chapter represents one of the best accounts of the ravages of neoliberal capitalism available. The climactic summary of the last 250 years is a powerful call to arms for activists: ‘The black heart of the beast is ever the same: the pursuit of profit’ (297). Fittingly, the book closes with an appreciation of one of history’s countless campaigns against oppression that flickered into vibrant life before being crushed by a merciless elite: the Jewish Revolt against Rome in the first century AD. Faulkner applauds the heroism of this and many other declarations of resistance from below. The rebels in that case were inspired by the myth of the ‘Jubilee’, an explosion from below that liberated slaves and swept away their masters. Our crucial task, he declares, is to ‘turn Apocalypse into Jubilee in the early twenty-first century’ (303). 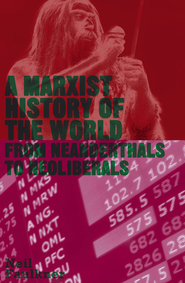 Thanks to Sean for this sympathetic and supportive review – one that displays a keen sense of what I was trying to do, and of the ways in which mine differs from other Marxist approaches. Unsurprisingly, the main area of disagreement is over my conflation of the ancient and feudal ‘modes of production’. This is too massive a subject to be dealt with adequately here, but it may be of interest to readers if I clarify what, in my view, underlies this disagreement. My contention is that a) the agricultural revolution and b) the bourgeois/industrial revolution (the latter essentially two parts of the same process, as Hobsbawm recognised when he coined the term ‘dual revolution’) are the main turning-points in human social development, dwarfing in their significance everything else that has ever happened. This necessarily means that the bourgeois/industrial revolution is a process of transition that exists in a different theoretical register from any putative earlier ‘transition’ from antiquity to feudalism. Like the agricultural revolution, the bourgeois/industrial revolution transforms the whole of human social experience. Nothing remotely comparable is represented by whatever changes occurred in the late antique/early modern period in Europe and the Middle East. Here is a somewhat different way of expressing the same basic idea. Before the agricultural revolution, humans were hunter-gatherers. After it, they were tillers of the soil, and, depending on the form of the superstructure imposed upon the agricultural productive base, they might be slaves, serfs, wage-labourers, share-croppers, tenant farmers, or freeholders (yeomen/kulaks). But these alternatives do not represent a sequence. There is no necessary, ‘inevitable’, ‘progressive’ development from slave (under antiquity) to serf (under feudalism). This is a mechanical (and false) 19th century ‘stages theory’. Then, as a result of a series of transformations between the 15th and 18th centuries in certain parts of Europe, we get the start of the process which transforms most of humanity from tillers of the soil into urban proletarians (a process still ongoing, with a majority having become urban proletarians only relatively recently). This is the nub of the argument. Or rather, this is what underlies it: the root of the disagreement. Hope that is useful clarification. I have just finished reading this book and would like to thank Neil for it, and the above reviewer, with whom I largely agree about the strengths of the book. To which I would add: it’s written in an appropriately challenging and thought provoking style, and is particularly strong on the history of the Second World War, it was good to read such a strong and uncompromising Marxist analysis of an event which has been obscured by bourgeois ideology in both historical accounts and cultural products. I have two worries about the book which I would like to share, however. One is what comes across as a ferocious anti-Communism in the passages about the Soviet Union and about Communist Parties across the world in the twentieth century. Is this really a balanced account? Many of the criticisms of ‘Stalinism’ as Faulkner terms it are very accurate and completely justified. But is it fair to silently pass over some of the progressive features of the Communist movement, including (for example) its role in stimulating Western capitalism’s creation of the welfare state and policies of full employment etc. ; and its role in stimulating and aiding movements of national independence and liberation across the globe? I ask this as a question, not as a damning criticism. Allied to this I have a niggling worry that Faulkner tends to inflate the significance of the successful people’s revolutions and attempted revolutions, and downplay the less extreme but nevertheless still clearly progressive (and sometimes far more democratic) movements for social change, such as the Labour victory and government after the 2nd WW. Does this not tend to force the free play of historical forces into a similar kind of schematic framework that he rightly criticises in Chris Harman’s work? And is there not a possibility of lapsing into a kind of underlying theoretical sectarianism and dogmaticism which seeks to endlessly replay the Trotsky/ Stalin disgreements through all other leftist interventions? Finally, a point about China which I hope is not connected, in the sense that I hope the reason for Faulkner’s approach is not anti-Chinese Communism. I found Faulkner’s views on the sameness of the agricultural mode of production to be convincing. But I found it very puzzling that he characterises the Chinese model since Deng Xiaoping as ‘neoliberal capitalism’. Can the same term that’s used to describe the violently aggressive, imperialistic, anti-regulatory systems of US and Western Europe, based on private ownership of the means of production and private appropriation of surplus value, be used to describe an economy that is still largely state-directed, and in which large flows of surplus value are invested and distributed in a way which has clearly lifted the standard living of enormous numbers of people? Let me again emphasise that these are minor criticisms and comments about an exhilarating and inspiring read, a work which not only explains a huge amount in a convincing way but equips the reader to apply the same analytical tools to current events, and to local and detailed histories not covered by the book. 1. I think the critical insight is that Stalinism was the form taken by counter-revolution in a backward, devastated, isolated country in the 1920s, where the old ruling class and state had completely disintegrated, and the only national force remaining was the new party-state bureaucracy. The essential content of Stalinism was given by: a) its need to accumulate capital in order to compete and survive economically and politically; and b) its consequent need to smash completely a revolutionary, proletarian, democratic mass-movement that might have resisted the high and rising levels of exploitation necessary to achieve this. This then means that whatever Stalinism does internationally reflects the interest of a counter-revolutionary elite presiding over a state-capitalist economy. Now, because capital and the nation-state are competitive, Stalinism sometimes supported progressive movements internationally; but only because, and only in so far as, it was in the class interest of the ruling bureaucracy to do so. Wherever it was not – in Spain in 1937 for example – it was willing to drown the revolution in blood as surely as it had done in Russia. 2. I accept the point about progressive movements that do not take the form of mass revolts from below, but flow through more constitutional/parliamentary channels. I think post-1945 Britain is a clear example. However, I would stress two things here: a) the British ruling class feared revolution in 1945 and were willing to make massive concessions to buy off a working class radicalised by the Depression and the War; and b) the system expanded rapidly after 1945 – indeed, the Great Boom of 1948-1973 is only matched in the history of capitalism by that of 1848-1873 – so that it was able to afford to price in reform and welfare necessary to stabilise the system. This was a very specific conjuncture in the history of the system. There are no signs at present of anything remotely like this being repeated. Thanks Neil for your quick response. I’d be grateful if you could address the point about China as well, if it’s not too much trouble. 1. The Maoist Revolution was a genuine national liberation struggle that destroyed the old Chinese ruling class and its foreign imperialist supporters. But the only truly national force remaining was the party/state/army infrastructure, and China was a desperately poor and therefore vulnerable country, so the priority was very rapid party/state-directed capital accumulation. China was a more extreme example of state capitalism because a) it came from an even lower socio-economic base than Russia, and b) there was no proletarian revolutionary movement, no workers’ democracy, to be crushed for the building of state capitalism could commence. 2. The evolution from pure state capitalism to a form of neoliberal capitalism in which the state continues to control a large chunk of the economy was relatively easy. The main political hiccup was the crisis around Mao’s death and the struggle against the ‘Gang of Four’ in the 1970s, but this played out with barely a ripple across the wider society. I use the term neoliberal capitalism to describe a phase in the development of the system internationally where the size of the dominant corporate entities is such as to dwarf the regulatory powers of most nation-states. Whether a corporation is owned by a bank, an oligarch, or a state bureaucracy is, in my view, quite secondary. Capital conforms to the imperatives of competitive capital accumulation on a global scale – irrespective of formal ownership. 3. All ruling classes respond to pressure from below and sometimes make concessions. Equally, all ruling classes conform to the imperatives of the market. Sometimes, there is a degree of conformity. It was in the interests of the Maoist state-capitalist bureaucracy to raise the standard of education, health, and welfare as far as possible, so as to improve labour productivity. But the ‘iron rice-bowl’ has been under attack for a generation, mainly because Chinese capitalism has positioned itself in global markets as a low-wage mass producer of consumer goods. Thus the succession of shocking revelations re conditions in Chinese factories – reminiscent of Engels describing Manchester in 1844 – and the firecracker of thousands of small-scale protests, strikes, riots, etc that have become the main form of the Chinese class struggle in recent years.